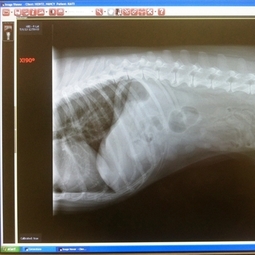 Digital x-rays are beneficial to you, your pet and our hospital in many ways! First, digital x-rays allow our doctors to better diagnose your pet. They are more clear and detailed. Our doctors can also have a better view of your pet's organs and skeletal system because digital images can be enhanced. For example, if your pet is experiencing back problems, the doctor can zoom in on specific areas of your pet's back and see very small details that would not have been visible on traditional x-rays. Digital radiography also allows us to be more efficient. It is time-saving. Our technicians can take the x-rays in our DHEC approved x-ray room and within minutes, the x-rays are available for your pet's doctor to review on any computer in our hospital. The doctor will then review the x-rays with you in the exam room on the large computer screens. Conveniently, digital images can also easily be emailed to you or other veterinarians if requested! Digital x-ray also saves energy. We also appreciate not having to deal with the chemicals associated with developing traditional x-rays. All-in-all, digital x-rays are incredible and we are so happy to have them available for our patients!